In the top spot last year was Valentine Elementary School, also in San Marino. In Niche’s rankings, elementary schools were evaluated specifically on their academics, diversity and teachers. Karen Hurley, principal of Palm Crest, said she was proud of any recognition her school receives and it was in good company with La Cañada and Paradise Canyon. “At Palm Crest, we are fortunate to have dedicated, knowledgeable and caring teachers as well as staff who go above and beyond to meet the needs of our students and ensure their success,” Hurley said in an email. She also mentioned supportive families, parent groups and other organizations as important. “Palm Crest Elementary is a family of learners who learn and grow together,” Hurley said. Emily Blaney, principal for La Cañada Elementary, said she doesn’t usually follow online rankings, but it was nice to learn her school, as well as Palm Crest and Paradise Canyon, had impressive scores. “It looks like state test scores are one of the largest deciding factors in Niche’s ranking, and those scores can be attributed to our hard-working students who are supported by their families and our wonderful LCUSD teachers,” Blaney said in an email. Carrie Hetzel, principal of Paradise Canyon, said the rankings are always nice when they reflect the hard work of students and teachers. 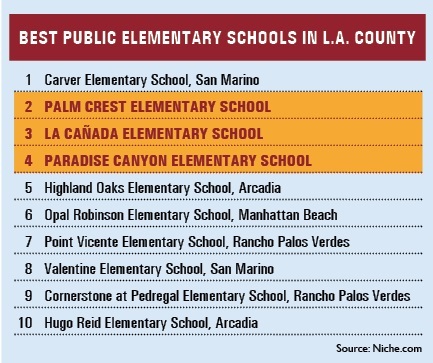 Statewide, the Palm Crest, La Cañada and Paradise Canyon ranked No. 14, No. 21 and No. 23, respectively. Last year, they ranked No. 23, No. 30 and No. 44. This is the fifth year the K-12 rankings have been released, according to Niche spokeswoman Jessica Hair. In 2002, the company was founded as College Prowler, which created physical guidebooks about colleges. A few years ago, according to the website, it went digital and changed its name to Niche.